I hope Mother’s Day was a good one for all of you moms out there. I gave my mom a call earlier in the day and my dad got on the phone to discuss wine, health, Kaweah, and other things. When he was done, Mom and I were able to chat. She’s always been like that – letting everyone else go first. I used to think that was a mom thing, but I’ve learned over the years that it is MY mom’s thing. She still moms me to this day and I’m still learning how special she is. Last month on the ski lift, I told my girlfriend that Mom is always reminding me about retirement contribution deadlines and limits. I said it as if it was a bit of a drag, but my friend turned to me, “You’re so lucky to have someone looking out for you like that. We don’t get that kind of advice from anyone in our families.” I’m so glad she said that, because it dope-slapped me into recognizing that my mom has always looked out for my (and now, Jeremy’s) best interests since the day she brought me into this world. thanks for everything, mom – i love you! Dad had taken Mom out for a nice lunch, so they decided to opt out of some yacht club shindig later in the day. Actually, yacht clubs don’t have shindigs – I believe it was a fancy cocktail party at the marina. Mom said, “We just can’t eat that much after a big lunch, and it’s too hot anyway. It’s 84 degrees.” I blinked. 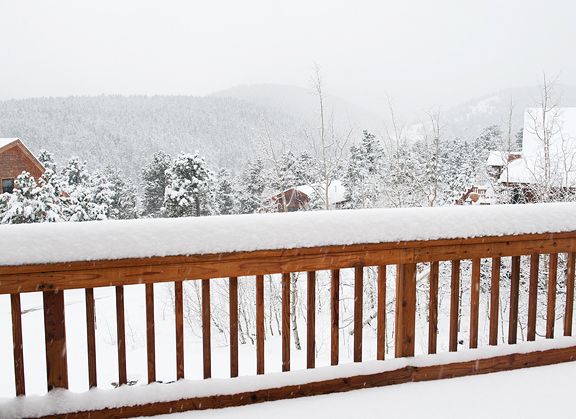 We had 5 inches of snow on our deck and it was still coming down. Kaweah was curled up in her doggy bed wrapped in her flannel quilt. 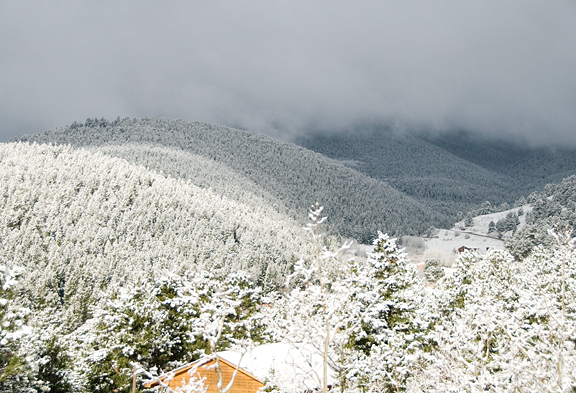 It’s always around this time of year I’m about ready to concede the snow to the progression of the seasons. 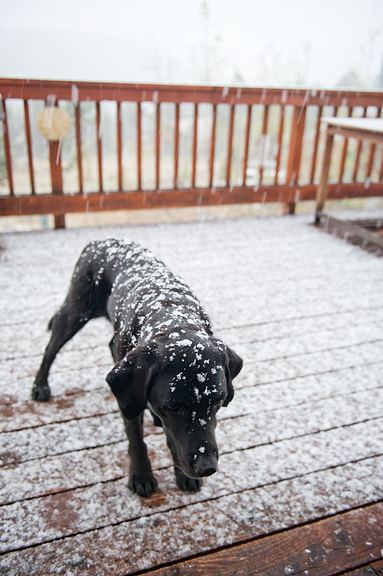 And then it snows. And then I begin to salivate in anticipation of more ski days. 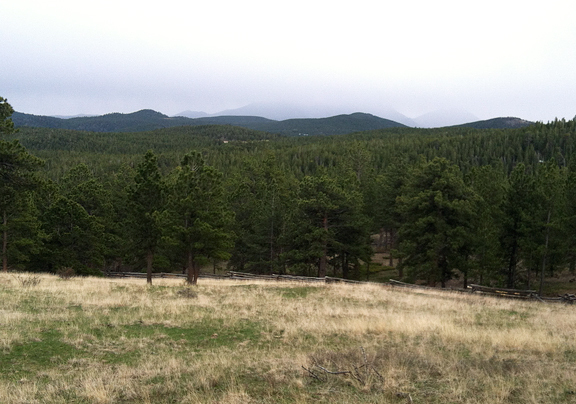 Jeremy and I logged some long trail runs on Saturday since they wouldn’t be clear of snow for several days. I’ll let you in on a little secret. 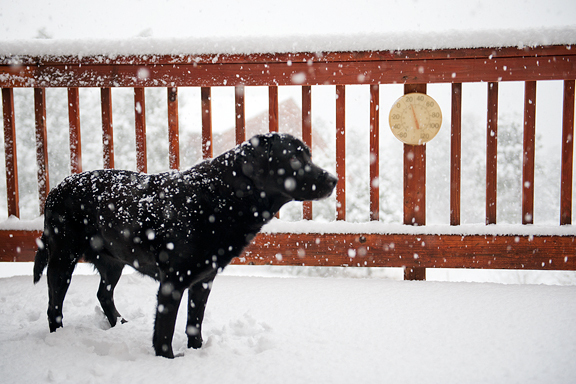 It’s not uncommon for Colorado to get snow in May. It happens more often than one might deduce from all of the howls of incredulity on the flats. I’m good with it, as you know. I’m never fully ready to accept the blast furnace of summer. Here’s another little secret I learned this past week. There is strawberry ice cream and then there is STRAWBERRY ice cream. ‘Tis the season for juicy red strawberries and I was determined to find a good and proper strawberry ice cream recipe. Scouring my books and the interwebs, I came across a recipe from Zoë who is as knowledgeable and trustworthy as she is friendly and kind. The trick to intensely strawberry-flavored ice cream is to roast the berries. If you’ve ever roasted vegetables, you know that it concentrates the flavors and enhances the sweetness. At first blush, I was dubious of the necessity of the balsamic vinegar. I knew a little acid was necessary to bring out the bright flavors of the berries, but I considered a dash of lemon juice after the strawberries were roasted. But Zoë and others have all sung the praises of balsamic vinegar, so I took a chance on it. You know what? DO IT. It’s fantastic and not really discernible other than the whole thing tasting like amazing punch-you-in-the-face strawberry awesomeness. The roasting takes 30 to 45 minutes, so allow yourself time to do that. You could also do it a day or two ahead and just keep the roasted strawberry mash in the refrigerator until you are ready to stir it into the custard. The custard I used is my go to vanilla ice cream. 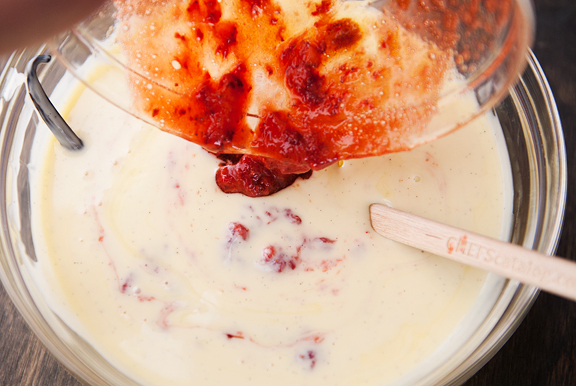 Vanilla and strawberries and cream are a magical food triumvirate, much in the way that corn and lime and chile are. Certain combinations just reside in the stratosphere. When the vanilla bean is done steeping (30 minutes), I like to reheat the milk until it starts to steam but isn’t boiling. Whisking the egg yolks, slowly pour a little of the hot milk mixture into yolks. You want to add a little at a time to “temper” the egg yolks. If you added all of the hot liquid at once, the yolks would cook. 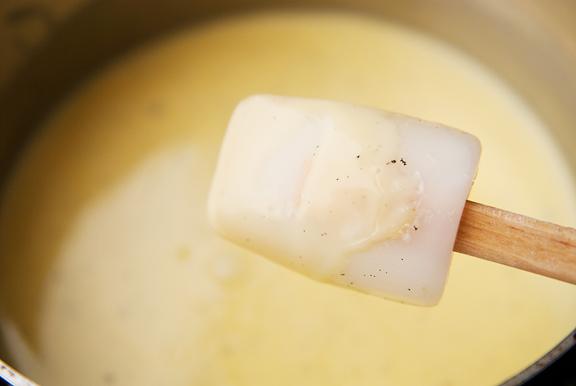 Tempering raises the temperature of the yolks a little at a time so there isn’t such a shock to the proteins when you incorporate the hot milk mixture. 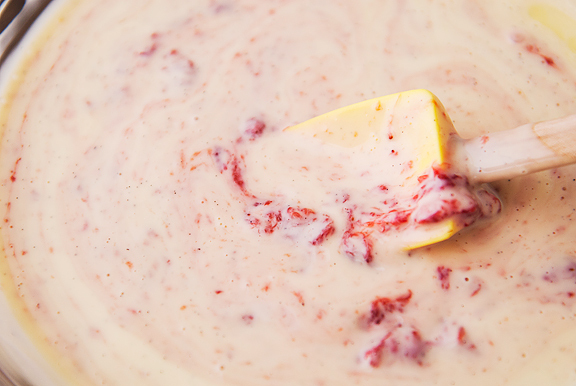 Stirring and heating this combination over medium heat will result in a lovely thickened custard – your ice cream base. By now, the strawberries should be done. 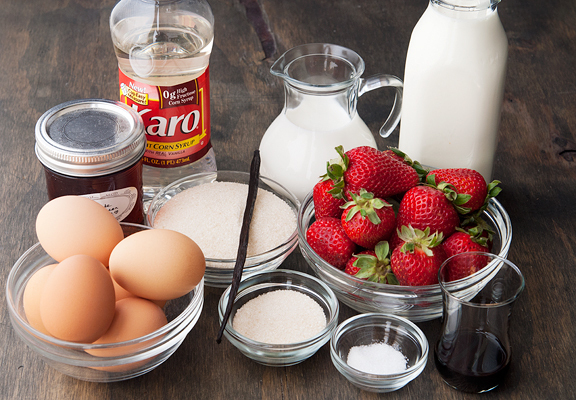 Try to scrape as much of the caramelized sugar as you can with the berries into a bowl. You want all of the juices too. 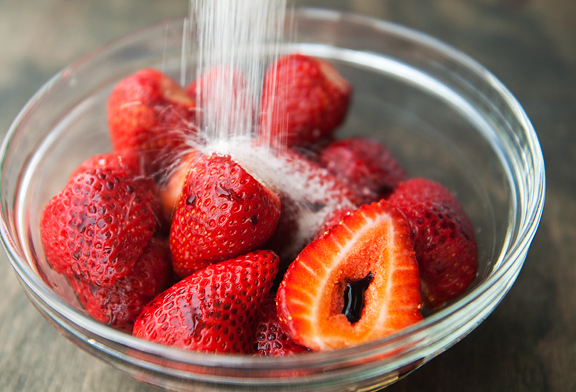 Don’t worry if the sugar is hardened, it will dissolve when you mash the berries up. The corn syrup (which is NOT high fructose corn syrup) is added to keep the ice cream smooth. You only need a couple of tablespoons. Stir the berry mash into the ice cream custard. You probably have a vanilla bean floating around in there. Leave it in there while the custard cools. You can cool it quickly over an ice bath or you can cover it with plastic and pop it into the refrigerator to chill completely. 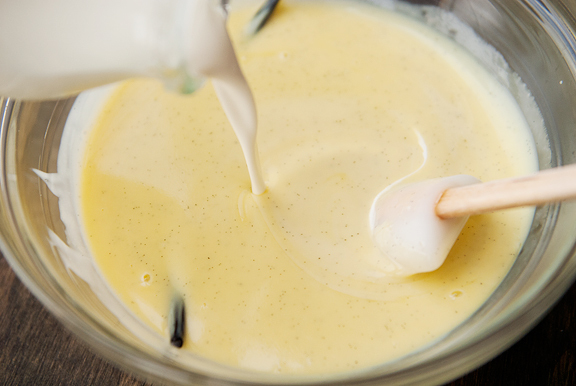 When the custard is completely chilled, churn it in your ice cream machine according to the manufacturer’s directions. This recipe makes nearly two quarts of ice cream, so it began to overflow a little in my ice cream machine (not a problem, just a mess). In this house, I have always been the strawberry ice cream fan. Jeremy has NEVER been a fan of strawberry ice cream. It was just boring to him and he has always opted for other ice cream flavors over strawberry. When I gave him a spoonful of the just-churned ice cream, he made those mmm mmm mmm noises typically reserved for anything in the chocolate family. “What was that?” I asked. “That is so good!” Yes, it is so good that he has had a scoop (or two) every night after dinner since I made this ice cream on Friday. 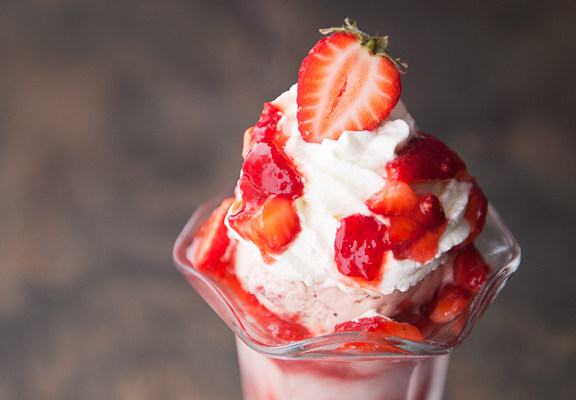 It really is dreamy, and this is coming from me – a true strawberry ice cream lover. It’s even more amazing dolled up with some fresh macerated strawberries and whipped cream. Now you have the secret. With great power comes great responsibility. Go forth and enjoy. Start the vanilla ice cream: In a medium saucepan, warm the milk, 1 cup of cream, 3/4 cup sugar, and salt over medium heat. Stir to dissolve the sugar. When the milk starts to steam, turn off the heat. Using the tip of a paring knife, scrape the seeds from the vanilla bean pod. Place the seeds and the whole pod into the heated milk. Cover with a tight-fitting lid and let steep for 30 minutes. Roast the strawberries: Oven 300°F. 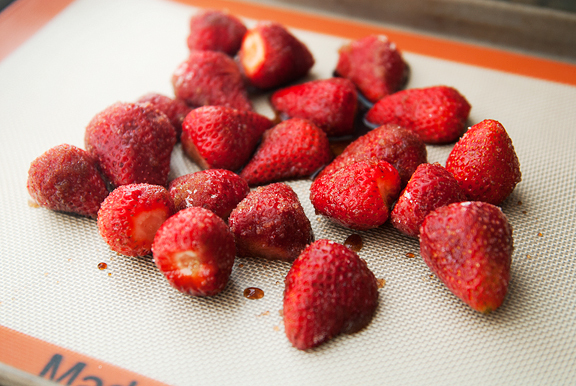 If the strawberries are large, cut them in half. 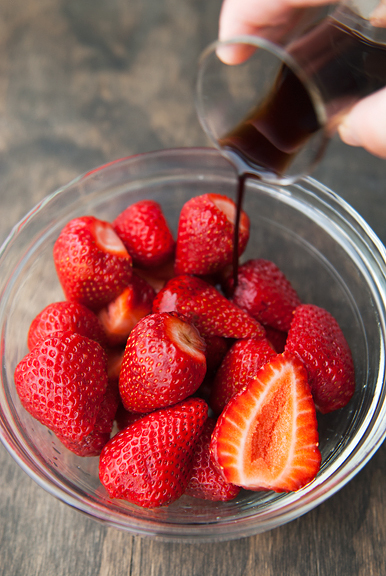 Place the strawberries in a medium bowl and toss with the balsamic vinegar and 2 tablespoons of sugar. Line a rimmed baking sheet with a silpat mat. 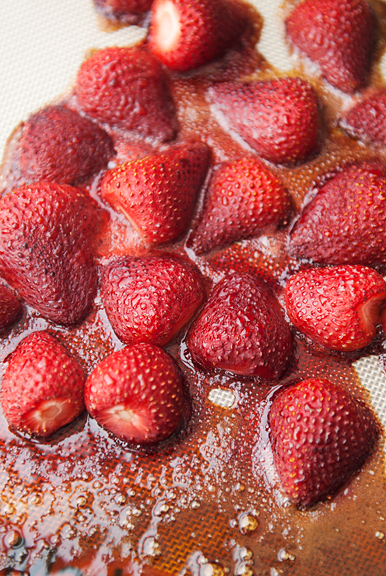 Pour the strawberries into the center of the baking sheet. Roast for 30-45 minutes until the juices start running from the strawberries and the berries look slightly mushy. Remove from oven and scrape everything (juices and caramelized sugar) into the same medium bowl. 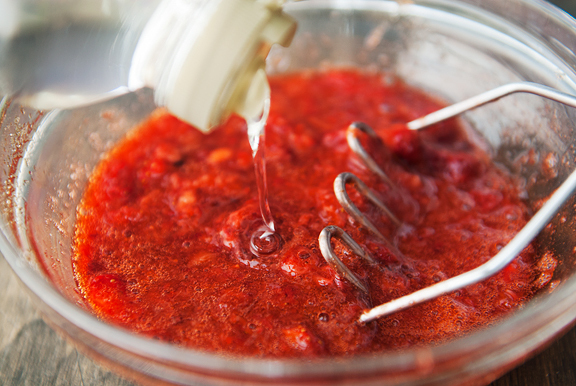 Mash the berries with a fork or a potato masher. Stir in the corn syrup. Set aside. 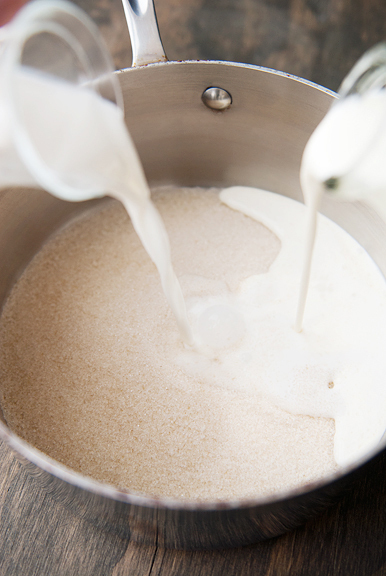 Make the ice cream: Warm the milk mixture up over medium heat until steaming. 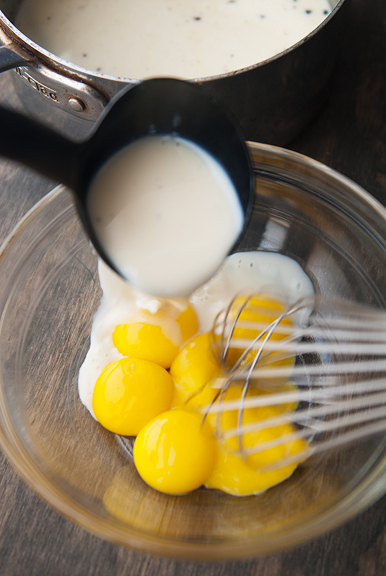 Place the yolks in a medium bowl and break them up with a whisk. Whisk in a half cup of the warm milk mixture until blended. Whisk in another half cup of the warm milk. Scrape the egg mixture back into the pan with the rest of the milk mixture, whisking to incorporate. 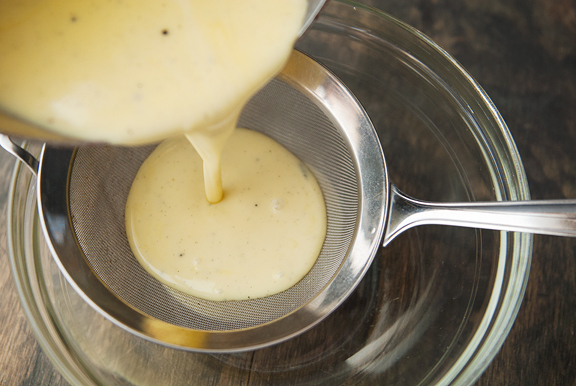 Set the pan over medium heat and stir constantly, making sure to get the corners of the pan, until the custard thickens and can coat the back of a spoon. Strain the custard through a fine mesh sieve into a large bowl. Add the remaining cup of heavy cream. Stir in the vanilla extract and the roasted strawberry mash. Chill the custard in the refrigerator (covered) or over an ice bath. 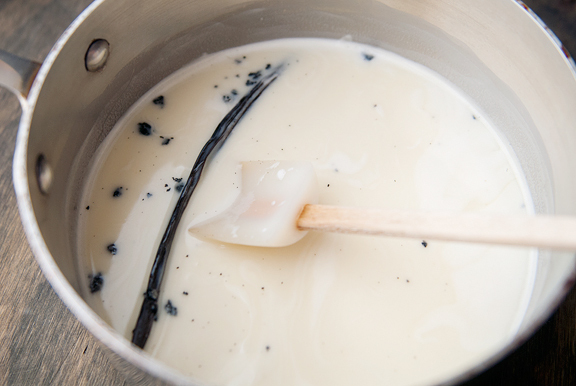 When the custard is completely chilled, remove the vanilla bean pod and churn the custard in your ice cream machine according to the manufacturer’s directions. Freeze the ice cream. Makes 1 3/4 quarts. 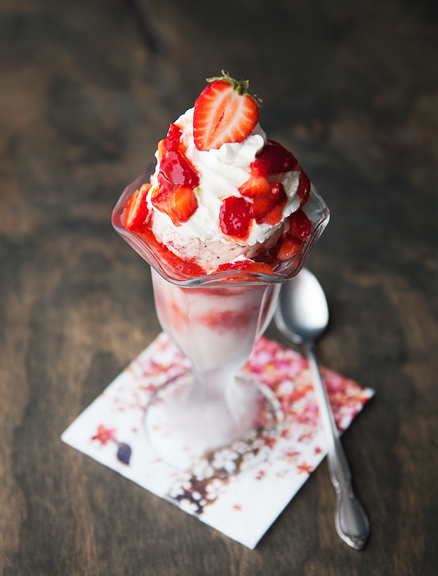 Oh wow…my mom was just telling me yesterday how she got free strawberry custard with strawberries on top for Mother’s Day, so I should make this when she comes to visit next month! But I’d better make 2 batches, because it will probably go fast between 6 people. Yum yum! Thank you! the roasted strawberries sound wonderful. I also like the ingredients of your ice cream base. yum! Oh my, this sounds delicious! Somehow I’m scared of roasting strawberries, but I should really give it a try! Man….this looks so good right now! You make me want to eat ice cream just before finals! I want to scream for ice cream! It’s time for me to get that ice cream freezer out again… And, wow, what a lovely little item to tempt me into getting busy. Hubby’s favorite of all ice cream flavor’s is strawberry. 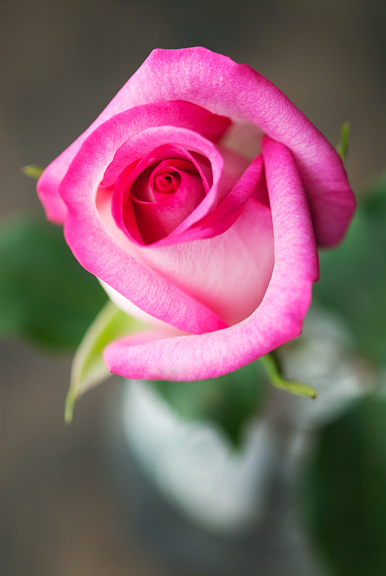 Love, love, love the photo of that beautiful rose. Simply gorgeous! You know I have never been a strawberry ice cream lover either. BUT! 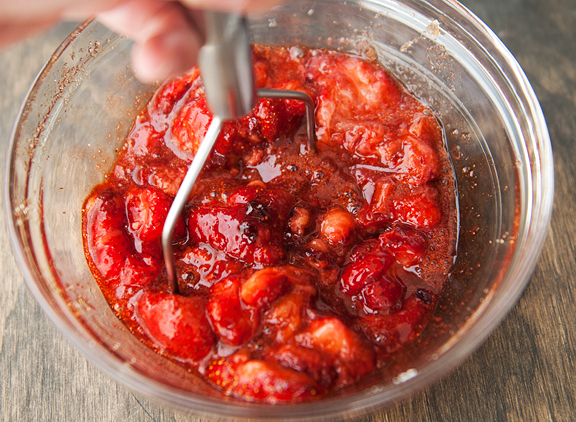 I do like strawberries and balsamic vinegar and a touch of pepper. So thanks for this idea. Now I can’t wait to try it! Wow, wow and wow! 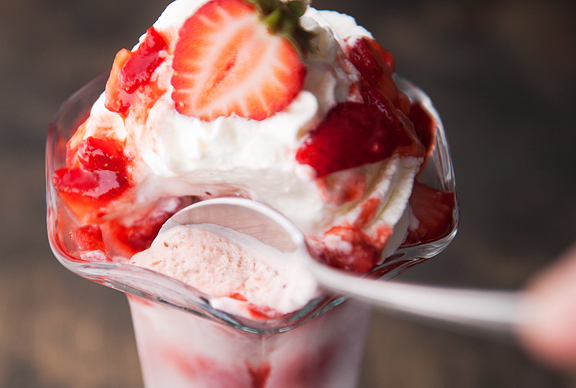 You are so right about strawberries, vanilla and cream. Vanilla brings out the strawberry in strawberry. Our strawberries come in August/September and I CAN’T WAIT! And I also have a birthday coming up along the way, so a super duper ice cream machine is top of the wish list. Did I say wow? And yum! Thanks for another wonderful flavour explosion, Jen. My mom and I have always had a special bond and she’s just truly an amazing woman. I see those similar characteristics that you describe here. She sounds like a lovely person… and it really is nice that we these people in our lives who are looking out for us. I love strawberry ice cream and really need to get on making a batch at home. Love that you roasted them first with the balsamic. Thank you for this wonderful recipe (and others)! I just made the ice cream and I’m going to churn it up for dessert tonight. I really enjoy your blog- it’s a new discovery for me. 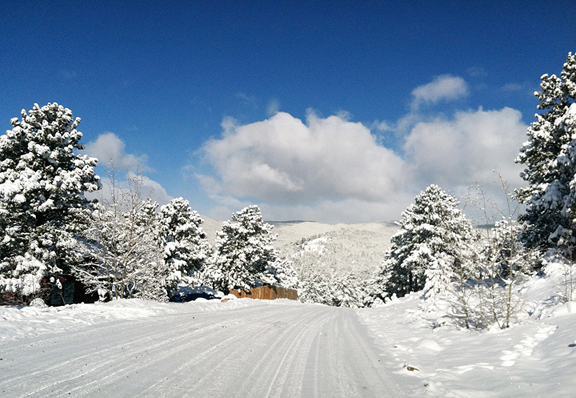 I live in Bend, OR and it’s nice to be reminded that there are places with winters longer than ours! Oh my goodness! I am craving ice cream SO much now that it’s getting really hot. This looks great! Erica – it’s delightful! And I too was scared to roast the strawberries, but now I can’t stop! CoffeeGrounded – your husband has great taste. Strawberry is one of my favorites! Abbe – oooh, maybe you should add some pepper to the ice cream?? Fiona – :) I’m sure the strawberries in Oz are amazing. Am making this now. Is all of the balsamic vinegar put in the pan to roast the berries? And then is it all added to the ice cream? I am afraid it will change the flavor. Beverly – Yes and yes.